SCVHistory.com AL1903 | Gorman | Camp Below Gorman, Cyanotype, 1903. 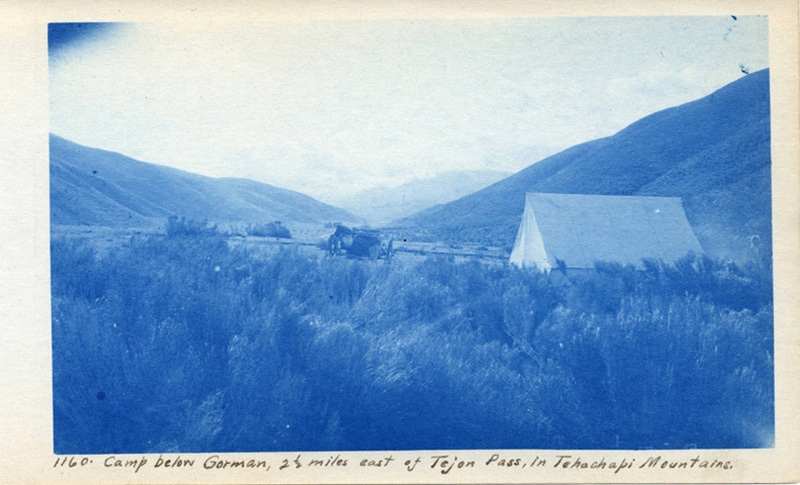 Cyanotype Photograph: "Camp below Gorman, 2½ miles east of Tejon Pass, in Tehachapi Mountains," 1903. This photograph was taken in 1903 using the cyanotype process, one of the first photographic printing processes. This process was invented in 1842 by English scientist and astronomer Sir John Herschel. Another British scientist Anna Atkins was the first to use this process in photography and is considered to be the first woman photographer. The process uses two chemicals, ammonium iron citrate and potassium ferricyanide, which results in a cyan-blue print. AL1903: 9600 dpi jpeg from 300 dpi jpeg of original cyanotype photograph.